If you’ve been on the internet long enough, you know that everyone who visits your website or finds out about your services will not hire you as a coach. Say only 1% of prospects hire you as a coach, what happens to the other 99%? Do you have an email newsletter visitors can subscribe to so you can develop a relationship with them? Do you have other products and services they can purchase at a lower price? Let’s face it. $250+ a month for a coach is a big investment for most people, especially if they’ve never experienced the benefits of coaching before. While some prospects will intuitively know that you’re the right coach for them. Others will need to get to know you better before spending their hard-earned money. You need to prove you’re credible and can support them to get the results they want. Their reasons may vary. The prospect may not understand the benefits of coaching or what a complimentary session is. They may be in a hurry or just having an off day. They may not be ready for coaching. One solution is to create a funnel of products and services. Mentally picture a funnel. The funnel is larger at the top, where the liquid is poured, after which the circumference decreases. With a coaching business (or any business) you need to have products and services at different levels in the funnel. The more hands-on or involved you need to be in providing the service, the higher the price. You need free or inexpensive offerings that a large number of prospects can access. A percentage of these people will buy your next priced product or service, such as a teleclass or mp3 audio program. A percentage of these purchasers will buy the next priced product or service, such as group coaching or a teleclass series. And a percentage of these purchasers will buy your in-person seminar or personal coaching etc. The funnel approach allows you to increase your sales by selling more products and services to more people. *Note: The fees and products/services in the above example are for illustration purposes. You need to decide which fees and products/services work best for your business. Hint: People learn by seeing (visual), hearing (auditory), or experiencing (kinesthetic). You’ll cater to more people if your funnel of products and services includes at least one item for each learning style. An ebook for the visual learners, a real audio or CD for the auditory learners, and a seminar or boot camp for the kinesthetic learners. 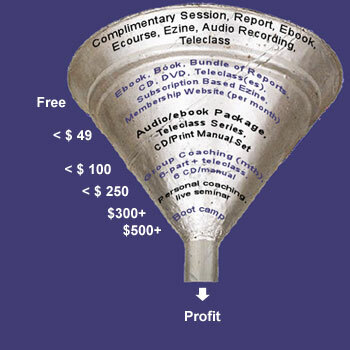 At the top of the funnel are the free or less expensive items, such as ezines or free teleclasses. An ezine or free monthly teleconference call are great ways to entice a visitor to give you their email address. This allows you to build your list and more importantly, build a relationship with your list. You’ve probably read that it takes a prospect at least 7 exposures to you before they finally remember you. An ezine or series of free calls is one way to do this. You must deliver quality, usable content and/or coaching in your contacts with the people on your list. This builds trust and credibility. Over time some of your prospects will buy your products and services. They may even tell their friends and colleagues about you. Part 2 in this series: What Do Your Prospective Clients Want? This entry was posted in Building a Business and tagged business building, funnel of products and services on May 14, 2009 by Become a Coach Team.